WASHINGTON — President Barack Obama hailed the nuclear deal with Iran on Friday as a “substantial success” and a model for future diplomacy, as world leaders took stock of the world’s most worrisome nuclear threats. Hosting his last nuclear security summit, Obama sought to use the controversial Iran deal as an argument for his carrot-and-stick approach to deterring nuclear proliferation, and he credited Iran with taking steps to meet its commitments. Critics of the deal in the U.S. and abroad are livid about the sanctions relief Iran is receiving in response. 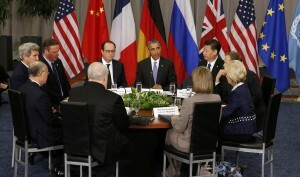 “It will take time for Iran to reintegrate in the global economy, but Iran is already beginning to see the benefits of this deal,” Obama said as he met with the leaders of China, France and other U.N. Security Council members that negotiated the Iran deal alongside the U.S.
Obama acknowledged that the nuclear deal hasn’t swept away other issues the U.S. and other nations still have with Iran; support for terrorism and Tehran’s ballistic missile program typically top that list. Still, he said all the nations that negotiated the deal could agree that it’s been an effective way to address the narrower issue of nuclear proliferation in Iran. “This is a success of diplomacy that hopefully we will be able to copy in the future,” Obama said. The huddle on the sidelines of the nuclear summit started off the final day on an optimistic note, as Obama worked to illustrate that progress has been made on his watch on stopping the spread of nuclear weapons. Yet the dozens of world leaders assembled were equally focused on other threats that have only increased in recent years, such as the harrowing prospect of the Islamic State group or other extremists getting their hands on a nuclear bomb. Frustration over the slow pace of reducing nuclear stockpiles has shadowed this year’s summit, Obama’s last major push on denuclearization. Frustration over the slow pace of reducing nuclear stockpiles has shadowed this year’s summit, Obama’s last major push on denuclearization. The absence of key players — especially Russia — further underscored the lack of unanimity still confronting global efforts to deter nuclear attacks. After six years of prodding by Obama and others before him, the global stockpile of fissile material that could be used in nuclear bombs remains in the thousands of metric tons. What’s more, security officials warn that the radioactive ingredients for a “dirty bomb” are alarmingly insecure in many parts of the globe. Ahead of the summit, fewer than half of the countries participating had agreed to secure their sources of radiological material, readily available in hospital, industrial and academic settings. Concerns about substances like cesium or cobalt getting in the wrong hands have escalated sharply following deadly attacks by IS, raising the disturbing prospect of a nuclear attack on a Western city. As the summit opened Thursday, leaders trained their focus on North Korea, whose continued provocations have stoked concerns throughout the region. Obama discussed steps to deter further North Korean missile tests during a meeting with Chinese President Xi Jinping. In another session with the leaders of Japan and South Korea, he called for vigorous implementation of stepped-up U.N. sanctions. President Vladimir Putin of Russia, whose massive nuclear weapons stockpile is rivaled only by the U.S., refused to attend this year’s summit. Moscow scoffed at what it deemed U.S. efforts to control the process and take power away from international agencies. Prime Minister Nawaz Sharif of Pakistan, another nuclear-armed country, canceled his trip following a bombing that killed 72.